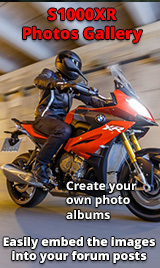 I'm planning to sell my 2015 S1000XR. Can you guys suggest any other bikes that offer that kind of quality, comfort and power to buy in place of my XR? Re: Selling S1000XR. What now? Another XR My previous bike which I would go back to lacks the outright power that being an RT but still might be worth a look. The other bike I owned which BMW don't make any more that might of fitted the bill is the mighty K1300S. I agree with Kamil, yep if not an XR the K1300s but you'll only get a second hand one as BMW stopped making them. Great long distance bike, big power good tank range, I got 200 miles easy two up with pans and top-box out of the two I had, down side bit on the heavy side and a bit long for fun with the litres spots bike boys. Good luck finding something to replace the XR. How much power do you think you will make use of? Get a Triumph Tiger 800 - it will stand up will to winter weather, give you protection - and good consumption. Get it 2yrs old. One thing I forgot to mention is filtering/lane splitting capability since i commute through congested streets of London. I don't suffer from the rose tinted glasses syndrome for the K series!! I still have mine,it has its uses but as an every day donkey you've gotta be joking. Changing from the XR to a bike with a throttle cable is also a culture shock you soon adapt and you then realise how little throttle you use on the 1000. S1000xr sounds perfect for what you're doing.